Bouyed by results of a survey that showed him closing the gap on President Emmerson Mnangagwa, opposition MDC Alliance presidential candidate Nelson Chamisa has declared he will win the July 30 poll outright. In a statement Friday, Chamisa's spokesperson Nkululeko Sibanda said the 40-year-old Kuwadzana East legislator will garner no less than 65% of the vote despite opinion polls showing him some 3% behind Mnangagwa. "President Chamisa will garner no less than 65% of the vote as the momentum for real change and transformation grips the nation," said Sibanda. "Without doubt, the MDC alliance has become a household name, dominating the discourse of foes and friends alike, all age groups, cutting across different tribes and races, blurring the fictitious divide between the rural and urban." Chamisa, according to Sibanda, has brought a "fresh perspective to political campaign in Zimbabwe" that "change has become the national mantra and a universal clarion call by all citizens, including those in Zanu PF". "As we enter the last stretch in this campaign president Nelson Chamisa is enjoying an upsurge in support, levels of trust, policy clarity and leadership grandeur. "He has unpacked a bankable and credible message on job creation, good governance, social service delivery, robust and modern infrastructure for the country and provided credible answers to fundamental national questions." Sibanda added that Chamisa has shown concrete proposals to resolve the cash crisis, corruption and general social services among other things. 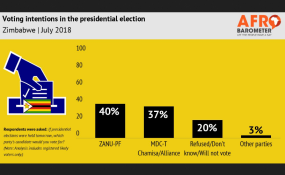 With Afrobarometer having indicated that at least 20% of surveyed Zimbabweans had refused to reveal their political preferences, Chamisa's team said these are opposition supporters scared of recriminations. "Given that only opposition supporters are likely to refuse to state their voting intentions, the 20% that refused to state their voting intentions are his voters," said Sibanda. "As such, nearly all these voters are in president Chamisa's column, meaning that his weighted total is 57% as a minimum. "Our projections show that he will win by 65% of the vote. "The polls show that there will be no rerun as an outright victory is certain." Afrobarometer also revealed that the majority of Zimbabweans believed Chamisa is more likely to deliver jobs if elected instead of Mnangagwa. "Asked about 'who will do a better job in creating jobs for the people' respondents said that Chamisa outranks Mnangagwa by 10 percentage points (42% vs. 32%). "The remainder either 'didn't know' or refused to answer (18% combined) or said 'neither of them' (8%). "It is therefore possible that perceptions of Chamisa as a more capable job creator - correct or not - probably help explain the MDC's recent gains in party identification."